A bright blue bus pulled to the curb in the busy Financial District, where two men in plaid shirts and backpacks were focused on their phones. Josh Pincus, 21, stepped aboard, greeted the driver and settled onto a padded bench at the rear, beneath a wall of distressed wood. An employee tended a small counter offering $7 juice and high-end coffee. The shuttle was roomy, cool, quiet and almost empty, with just five other, youngish passengers hunched over phones and laptops. Pincus’ ride, operated by Leap, is one of several start-ups providing an alternative to San Francisco’s aging, crowded bus network. 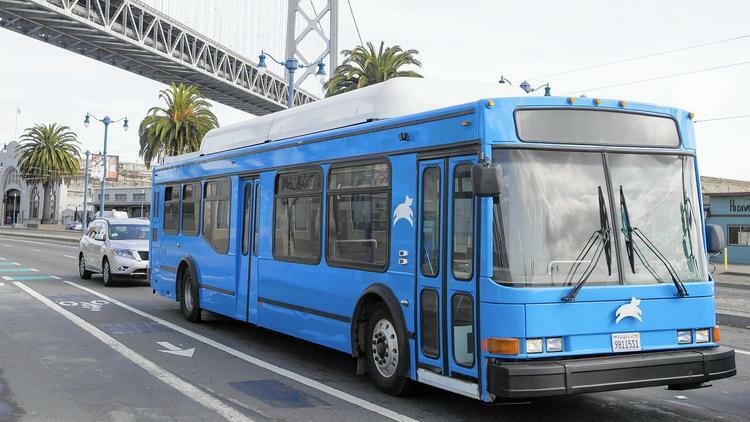 The company and its main competitor, Chariot, run short, peak-hour shuttle routes between the Financial District and the Marina, a pricey neighborhood popular with young entrepreneurs and investment bankers who complain of unreliable and infrequent Muni service. The start-ups, both less than a year old, have drawn comparisons to Google’s sleek buses, which sparked protests last year among activists who said the shuttles were exacerbating gentrification by connecting higher-income commuters to neighborhoods with otherwise poor transit service, driving up rents. Some fear Leap and Chariot could further stratify San Francisco commuting options between rich and poor — and reduce pressure to improve the public transportation network.